MIAMI, March 6, 2019 /PRNewswire/ -- Carnival Cruise Line today announced that it has partnered with world-renowned chef and restaurateur Emeril Lagasse on his first-ever seagoing restaurant aboard Carnival's newest and most innovative ship, Mardi Gras, setting sail in summer 2020. Located in the heart of Mardi Gras' French Quarter zone, Emeril's Bistro 1396 will showcase the chef's signature dishes that earned him the reputation as one of New Orleans' most acclaimed and respected chefs. "Mardi Gras is designed as the ultimate vacation experience, and that extends to the food and beverage offerings," said Christine Duffy, president of Carnival Cruise Line. "Emeril Lagasse has brought the uniqueness and fun of New Orleans dining to foodies all over the world, and we're thrilled that he'll now bring that same experience to Carnival. There is no one better suited than Emeril to add a level of authenticity to the Mardi Gras experience that will give our guests another way to Choose Fun." "I've developed restaurants all over the country, but to create my first restaurant at sea – on a ship named Mardi Gras with its own French Quarter, no less – was an opportunity I simply could not pass up," said Lagasse. "I'm excited to be a part of this brand new ship and bring a taste of the flavors of New Orleans cuisine to the guests sailing on Mardi Gras." Named after Mardi Gras' hull number at the Meyer Turku shipyard in Finland, the bistro will celebrate New Orleans' rich culture with Creole favorites and daily specials. The menu will include: oyster and cochon de lait po-boys, muffaletta sandwiches, Emeril's signature barbecue shrimp, fresh seafood ceviche, roasted duck & Andouille sausage gumbo, jambalaya, and complements such as Creole potato salad with diced scallions, and red beans and "jazz-man" rice. Breakfast offerings will feature shrimp and grits and a shrimp Creole omelet. The New Orleans classic Bananas Foster and lemon ice box pie will be available for dessert. 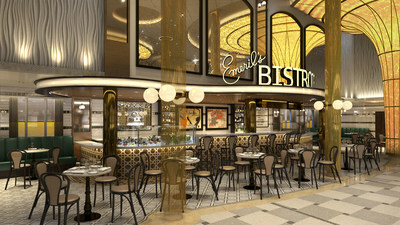 Emeril's Bistro 1396 will take center stage in Mardi Gras' French Quarter, one of the ship's six themed zones where guests will find fun, memorable ways to create their own personalized vacations. The French Quarter will capture the festive spirit of Louisiana with food, cocktails and, of course, live jazz. Emeril Lagasse is the chef/proprietor of 11 restaurants, including four in New Orleans (Emeril's, NOLA, Emeril's Delmonico and Meril); three in Las Vegas (Emeril's New Orleans Fish House, Delmonico Steakhouse and Lagasse's Stadium); three at the Sands Casino Resort Bethlehem in Pennsylvania (Emeril's Fish House, Emeril's Chop House and Burgers And More by Emeril); and most recently, one in Miramar Beach, Florida (Emeril's Coastal Italian). As a national TV personality, he has hosted more than 2,000 shows on the Food Network, and is the food correspondent for ABC's "Good Morning America." Most recently, Amazon launched an original series featuring Lagasse called Eat the World with Emeril Lagasse. The series received five daytime Emmy nominations and won Outstanding Culinary Program. The series was also a James Beard semifinalist in the category Outstanding Personality of Host. Lagasse has appeared as a guest judge in five seasons of Bravo's hit food series, "Top Chef," and two seasons of "Top Chef Jr". He was named a co-host on the last three season of the "Rachael Ray Show," and has appeared on the Cooking Channel with five seasons of "Emeril's Florida." Lagasse is the bestselling author of 19 cookbooks, the latest titled Essential Emeril: Favorite Recipes and Hard-Won Wisdom from My Life in the Kitchen. In 2002, Lagasse established the Emeril Lagasse Foundation to support children's educational programs that inspire and mentor young people through the culinary arts, nutrition, healthy eating, and important life skills. To date, the Foundation has distributed $10 million in grants benefitting children's charities in New Orleans, Las Vegas and on the Gulf Coast. In 2013, Lagasse was named the Humanitarian of the Year by the James Beard Foundation for his dedicated efforts to further the culinary arts in America, as well as his philanthropic work supporting children's educational programs through his Foundation. In January 2019, Lagasse launched We Love Food Hospitality, a new consulting division of his culinary empire. We Love Food Hospitality consults with both existing and new concept restaurants on menu development, culinary training, and other restaurant operations. Lagasse's restaurant company, Emeril's Homebase, is located in New Orleans and houses culinary operations and a test kitchen for recipe development. For more information visit emerilsrestaurants.com.